In the Sachsenhausen district in Frankfurt, you can experience a tradition of Frankfurt. 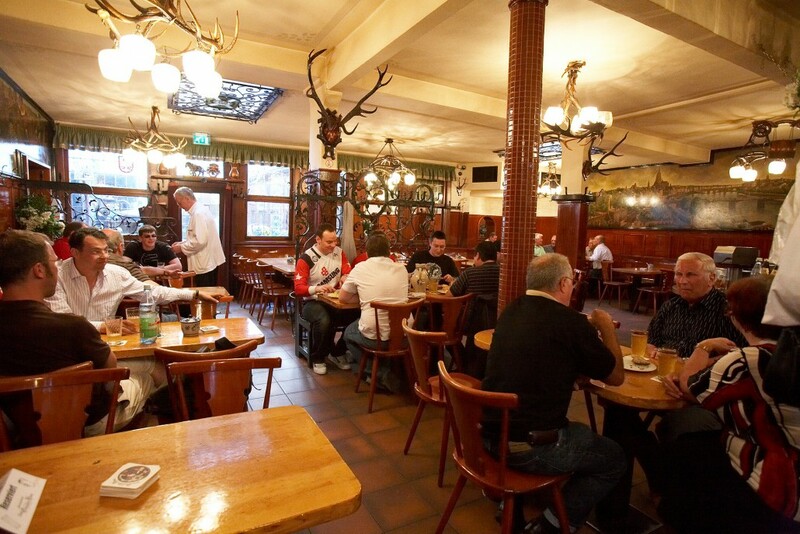 There are a lot of pubs and restaurants which serve Apple wine as well as traditional German cuisine, and Zum Gemalten Haus has one of the oldest and genuine ones. Zum Gemalten Haus has long history and local famous place, which means the everydays life of Frankfurt is there. I hope you will experience their tradtion and Apple wine will be something which remind you of Frankfurt. Zum Gemalten Haus was started in 1936, and since then many locals have frequented through their lifetime. 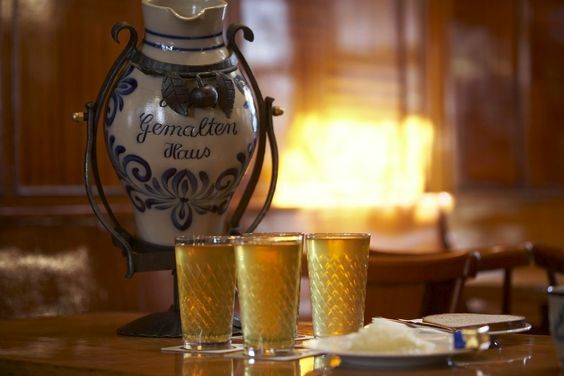 When you go to Zum Gemalten Haus, you will see a lot of elderly people enjoying chatting over Apple wine. It seems they grew up with Zum Gemalten Haus and Apple wine. The typical German scene, the comfortable music, warm and friendly stuff. There are always reasons to come back. 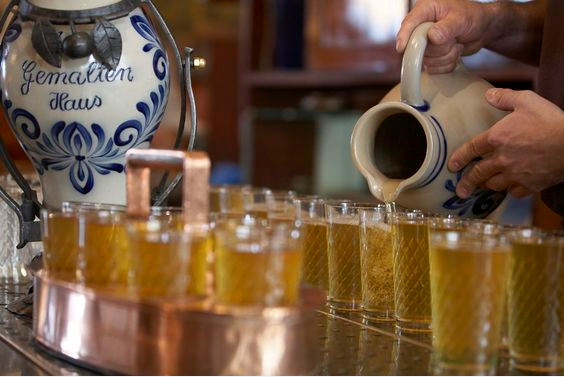 Apple wine (Apfelwein) at Zum Gemalten Haus made from their secret recipe is not the same as one found in other place.It is poured from wooden barrels and the long history makes it authentic. The taste is different depending on weather conditions, sun exposure and age, however Zum Gemalten Haus always offer you very high quality one. Some say it is great, others say thin or too sour. There are various opinions over it from tourists. But it is always loved by locals because they know it. Nobody knows if you like it or not till you actually try. You just have to try, it is their culture. After enjoying original taste, some people arrange it such as adding sparkling water or lemonade. It let you enjoy the world of Apple wine more. 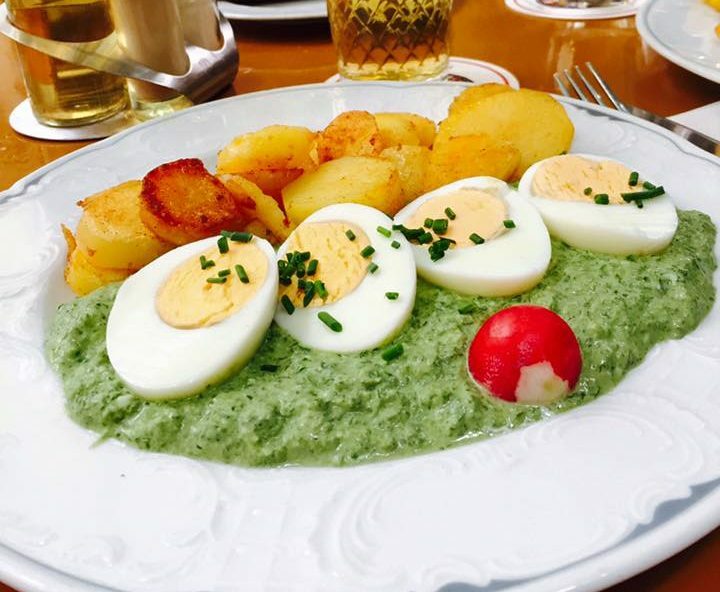 The green sauce (Grüne Soße) is another thing you should know before your visit. It is a Frankfurt regional herb sauce. The only specified seven regional herbs ( borage, chervil, cress, parsley, salad burnet, wild sorrel, chives) are allowed to be used for it. The green sauce is usually eaten with boiled eggs or fried potatoes. However, some people have it with beef or pork. 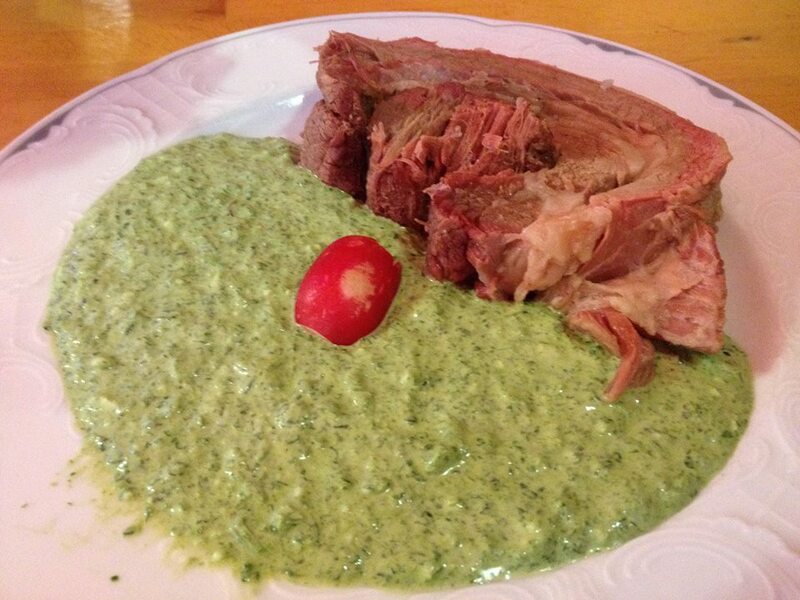 At Zum Gemalten Haus, you are allowed to add the green sauce to any dishes . The beautiful green color decorates the dish and you will smell the fresh flavor. Their signature menu are German style pork chops, Black pudding and liver sausage, Frankfurters. They are top 3 their traditional dishes. And most of dishes have sauerkraut in side, which is another traditional cuisine. Other menus I recommend are Beef tongue and Schnitzel. Beef tongue is very soft and tender, Schnitzel is huge. Both go very well with the green sauce. 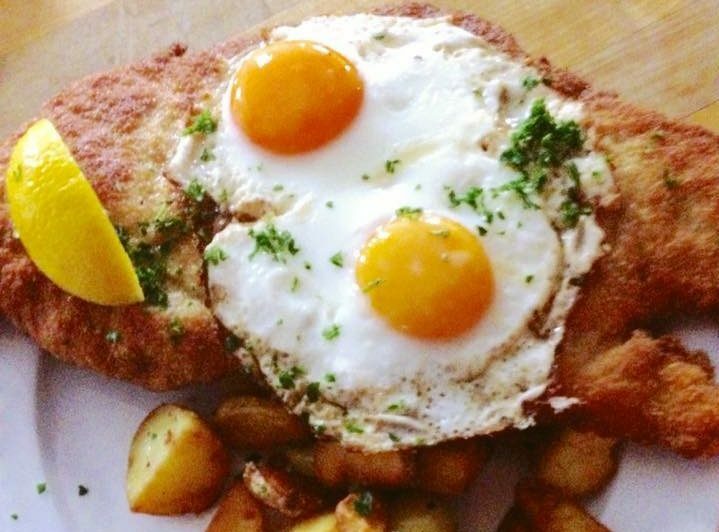 The menu at Zum Gemalten Haus is limited to focus on only traditional dishes. 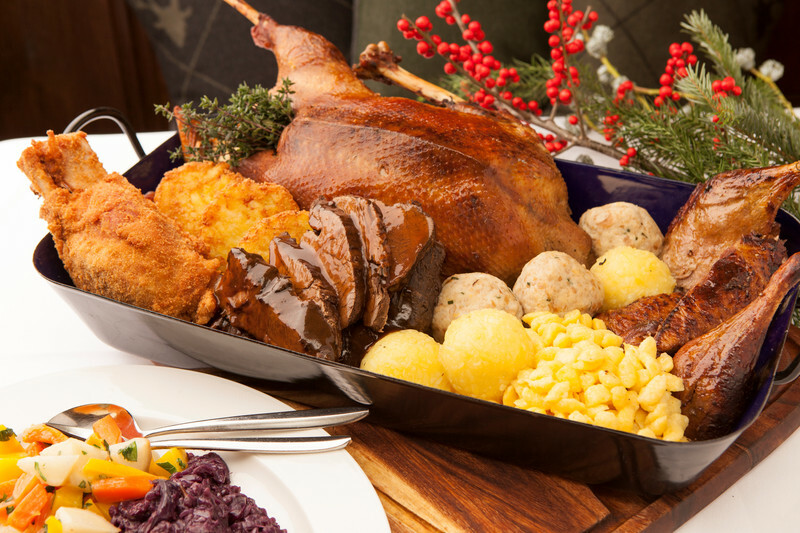 It lets you experience the true German cuisine. If you are in Germany, beer with meal is a must. Wirtshaus Ayingers, a restaurant located in the heart of Munich, offers Bavarian cuisine which can be great company with beer. On the Zülpicher Straße which is the street with array of pubs, there is an old fashioned pub, Bei Oma Kleinmann. The old and graffiti-covered restaurant is easily skipped if you do not know how great foods they serve. 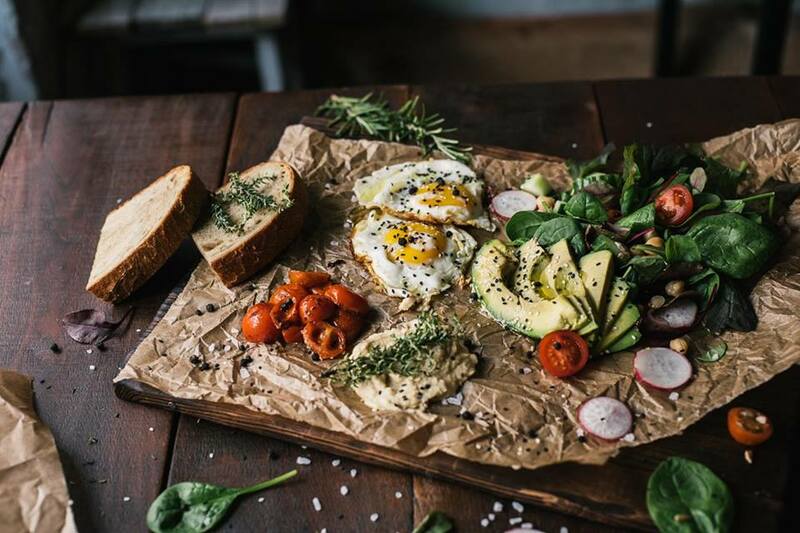 The cafe Roamers is not just a place which serves coffee or cake or sandwiches. It is a place where lets you forget a daily life and gives a rest to your heart. 【Paris】For a Great Start of a Day, "Benedict"
【Sydney】Amazingly Tasty Products, "Bourke Street Bakery"